Within this question is an assumption (which is all too plausible) that Australia has done – and still does – very little to contribute to the making of a world that can live at peace with itself. The grim truth is that for most of the history of European intervention on this continent, Australian governments have spent far more of the country’s resources on fighting wars than on contributing to peace making. In the beginning there were wars against Indigenous Australians. (And given the composition of our prison population today, those wars are ongoing, albeit in a different form.) From the late nineteenth century – and ever since – this country’s proclivity for war-mongering has extended way beyond its shores. Australians have fought, and continue to fight, in other states’ wars – most of them ‘unnecessary wars’ as Henry Reynolds has so aptly labelled them. In sublime contrast to Hobbes, the eighteenth century German philosopher, Immanuel Kant, argued that by participating as free and equal citizens in properly constituted – that is, truly democratic – republics, we humans possess the imaginative powers to live richly fulfilling lives within a pax aeternum (a state of ‘perpetual peace’). He wrote: ‘…reason, as the highest legislative moral power, absolutely condemns war as a test of rights and sets up peace as an immediate duty.’ This, he argued, may be achieved through ‘a federation of peoples’ across the globe – something like an uncompromised United Nations Organisation, if you like – that would nurture a world at peace with itself. In the face of Kant’s admirable idealism, Australian foreign and security policy has been consistently Hobbesian in its formulation and application. The first manifestations of our very own ‘war of all against all’ are vividly evident in the massacres of Aborigines throughout the late eighteenth, the nineteenth, and well into the twentieth centuries, and the violence against Chinese gold seekers in the middle of the nineteenth century. Our inclination for belligerence moved up a gear when the Australian colonies sent troops to the Boer War at the end of the nineteenth century. Then it was off to World War I, as the new federal government enthusiastically sided with what was then called ‘Great Britain,’ in the firm belief that Australia was an integral part of the British Empire – that we were Britain’s ‘mates in the Empire’, as Donald Horne portrayed us. Australian War Memorial Canberra. Nicholas Brown. flickr cc. At first it was a ‘boys own’ great big adventure until the diggers were traumatically confronted by the hideous realities of mud and rats, by the horrifying screams of the wounded, by the mounting deaths of comrades, by the gas and stench of the trenches in France and Belgium, by the furnace and fury of the North African deserts, and then by the grim catastrophe that was Gallipoli. Yet we remained cravenly loyal to the Empire, right up until that fateful second week in February 1942, when Singapore was over-run by Emperor Hirohito’s Imperial Forces. The fall of Singapore abruptly taught Australians that their security dependence on the British was now misplaced. But instead of choosing independence, they turned to the United States of America, eventually framing their alliance with this latest ‘great and powerful friend’ in the ambiguous terms of the ANZUS treaty that came into force a decade after what has been rightly described as the ‘bloody shambles’ of Singapore. Whenever our great and powerful ally calls on us – and sometimes even before they call on us – we are more than ready and willing to leap to America’s side, whether it be on the Korean Peninsula, throughout the terrible years and proxy wars of the Cold War era, in Vietnam, in Afghanistan, in Iraq, in Syria and in other clandestine conflicts about which the Australian public rarely hears. And now we have a Minister for Defence who wants to capitalise on Australia’s proclivity for going to other people’s wars by making the country a major arms exporting nation – including, it must be noted, exporting arms to Saudia Arabia. 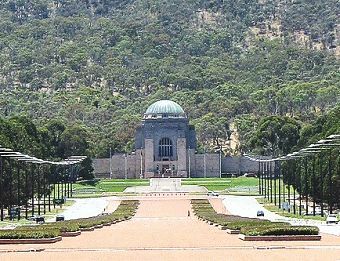 We have a Prime Minister who has recently announced that his government will outlay half a billion dollars on enlarging the National War Memorial in Canberra – effectively celebrating war rather than interrogating it as tragedy. Meanwhile Australian war veterans continue to suffer with inadequately funded post-service medical and psychiatric services. There are some signal diagnoses of Australia’s embrace of war as a national pastime, as if it’s some kind of sport, like footy or cricket. Geoffrey Blainey told us that it was because we are tyrannised by the distance between us and nearly all our sister nations in the so-called ‘Anglosphere’ (Britain, Canada, and the United States – with of course New Zealand being close, even as we try hard to forget it’s there, because they defeat us regularly at rugby, or, more importantly, generously offer refuge to the asylum seekers we are brutally incarcerating on Manus and Nauru). David Walker nailed it better by showing that Australia is a nation within whose collective consciousness culturally entrenched anxieties fester, like abscesses on the body politic, about our geopolitical proximity to Asia and Asians. Allan Gyngell has pointed to our related ‘fear of abandonment’: a deep-seated sense that unless we consistently prove our abject loyalty to great and powerful allies we’ll be ripe for attack or invasion; a fear that we are alone in an alien region and a threatening world. Meanwhile, Marilyn Lake has shown how the extraordinary – and growing – national enthusiasm for celebrating ANZAC Day says much about the jingoistic militarisation of our history, particularly since the time of John Howard. This belief is worrying because it is indicative of a lack of a national self-awareness about what kind of country we are, and how we might be regarded in our region, and internationally. This is actually dangerous for the country’s security. Interrogating the middle power assumption underlying Australian foreign policy is a matter of urgency. Prof. Allan Patience is Principal Fellow in the University of Melbourne School of Social & Political Sciences. This is the first half of an address at the Remembrance Day Peace Conference, ‘A World at Peace with itself: elusive Dream of achievable Goal?’, on 11 November 2018. The full address can be found here. 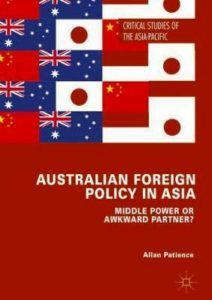 See also A. Patience (2018), Australian Foreign Policy in Asia: Middle Power or Awkward Partner (London: Palgrave Macmillan), and A. Patience and C. Roy (2019), “Interlocutors for Peace? Bringing middle powers in from the theoretical cold,” in T.S. de Swielande et al. (eds), Rethinking Middle Powers in the Asian Century (London: Routledge).